During your stay in Notos Villas (in Fragocastello,Sfakia, South Crete) you’ll experience Cretan hospitality, in warm family atmosphere, and we will see personally to anything you need. Notos Villas offer you calm, relaxing holidays, in the nature, far from the noisy city. It’s an ideal choice for families with small children, but also for the couples who want a romantic getaway. It’s situated on a green 9 000 square meters piece of land, near the stunning beach "Orthi Ammos", nature and sea lovers will be thrilled. 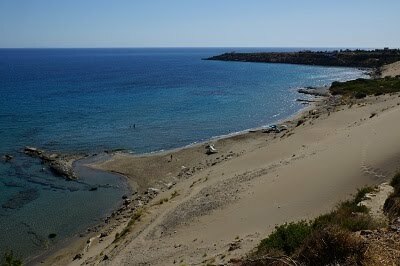 The legendary Fragocastelo nearby, famous Sfakia – perhaps the most traditional and classic Cretan village – and the beautiful Kallikratis Gorge will enchant those who love legends, history, traditions and exploration. Notos Villas has three spacious (over 75 sq.m. ), comfortable, bright and cool detached houses, with garden, terrace and a parking lot. Each one has two bedrooms, living room (with extra bed), kitchen, bathroom. All houses are air-conditioned, have satellite TV, washing machine, fridge with freezer, kitchen stove with oven. They can lodge up to five persons. Notos Villas may also offer you a long-term rental, on agreement.